This austere-looking stone lighthouse is tucked away in the southeast corner of Connecticut, at the foot of Water Street in the compact, picturesque old borough of Stonington. It's the only lighthouse on the mainland in Connecticut that’s open to the public on a regular basis. The fortress-like exterior belies the warm and inviting atmosphere found inside the Old Lighthouse Museum run by the Stonington Historical Society. It’s a real gem for anyone interested in the colorful past of this area. Stonington boasts many beautiful eighteenth and nineteenth-century buildings and a rich history dating back to the mid-seventeenth century, when it was first settled. One of the most celebrated events in Stonington history occurred in August 1814, when outgunned townspeople repelled an attack by five British warships under the command of Commodore Thomas Hardy during the War of 1812. There are no rivers within the town deserving notice; the Pawcatuck, which runs upon its eastern border, and separates it from Rhode Island, and the Mystic, that forms its western boundary, and separates it from Groton, are short but considerable streams. There are 1100 tons of shipping owned in this town, which are employed either in the business of fishing, or in the coasting and West India trade, and which furnish employment to a portion of the inhabitants. The maritime situation and interests of the town have given a direction to the pursuits and habits of its citizens; and Stonington has become conspicuous as a nursery of seamen, distinguished for their enterprise, perseverance and courage. Niles also reported that the town had ten to fifteen vessels engaged in fishing and a number engaged in coastal trade. The first Stonington sealing ship, the brig Frederick, sailed to Antarctic grounds in 1818. Captain Nathaniel B. Palmer of the sealing sloop Hero is credited with discovering the Antarctic continent two years later. Between the 1820s and the 1850s Stonington also had a number of vessels engaged in whaling. With all this activity, it’s no surprise that in May of 1822, Congress appropriated $3,500 for a lighthouse at the east side of the entrance to the harbor. The new light would serve to guide vessels passing through Fisher’s Island Sound as well as those headed for the harbor in Stonington. The lighthouse was built during the following year by contractor Benjamin Chase of Newport at a cost of $2,916.57, and it was first lit in 1824. The first keeper was Capt. William Potter at a yearly salary of $300. The 30-foot cylindrical, stone tower's fixed white light was produced by a system of ten whale oil lamps and parabolic reflectors. An 1838 inspection found the lighthouse in poor condition. Most of the silver coating had been rubbed off the reflectors by too much polishing and the tower's wooden stairway was in danger of collapse. In addition, the lighthouse itself was in danger of being claimed by the sea, which was eating away at the bluff beneath the tower. The government considered building a wall around the station, but decided instead to build a new lighthouse further back from the eroding shore. The second lighthouse was completed in September 1840 by John Bishop of New London. The rebuilding cost $4,914 in all, including $1,906 for a new cylindrical lantern and lighting equipment consisting of eight lamps and 16-inch reflectors. The new light was exhibited from 62 feet above sea level. The new lighthouse consisted of a stone tower, 32 1/2 feet high, attached to the keeper's house. 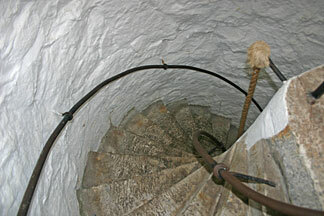 A granite spiral stairway led to the lantern room, where an improved system of eight lamps and reflectors was installed. In 1856, the lamps were replaced by a new sixth-order Fresnel lens. Captain William Potter was keeper of the lighthouse until his death in the mid-1840s. His wife, Patty, became keeper after her husband's death. One inspector found the dwelling at this time to be the "most filthy house" he had ever visited. Perhaps Mrs. Potter's housekeeping skills improved, as she remained keeper for six more years. A new 25-foot cast-iron lighthouse was erected on a breakwater in Stonington Harbor in 1889, rendering the old lighthouse obsolete. The keeper of the breakwater light lived in the old dwelling until 1908 when a new house was built. The breakwater light was replaced by a skeleton tower in 1926. 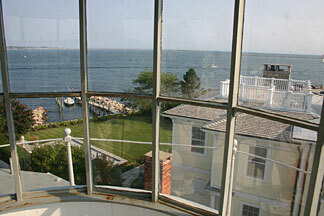 The fortress-like stone lighthouse was acquired by the Stonington Historical Society in 1925. They converted the interior into a six-room museum of local history, including paintings, whaling and fishing gear, and an exhibit on the lighthouses of Long Island Sound. The museum is open May through October. 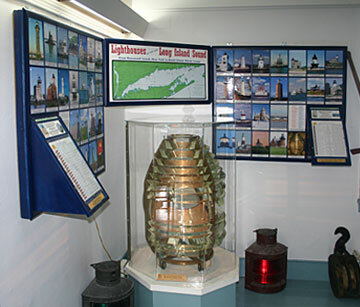 A fourth-order Fresnel lens is on display in the museum, inside a protective case donated by the New England Lighthouse Lovers. An area in the museum floor is cut away to show the old cistern underneath that supplied water for the keepers and their families. Visitors are welcome to climb the tower for a magnificent view of three states. William Potter (1824-1842), Patty Potter (1842-1854), Luther Ripley (1854-1861), Winthrop Hand (1861), Henry Burgess (1861-1869), C. E. P. Noyes (1869-1872), Benjamin F. Pendleton (1872-189? ), Joseph F. Fuller (1898-? ), George W. Beckwith (c. 1920s).